Round One of the AFL Home and Away Season, was played out over the weekend. Many games were close contests , with the victors winning by one or two points . Collingwood and Essendon were the notable exceptions . Both teams thrashed their opposition . The Swans and Demons , staged a thrilling draw at the MCG , and the Saints , were unlucky to be beaten by one point by the Cats , in the closing minutes of play . New Queensland team, the Gold Coast Suns had a bye . 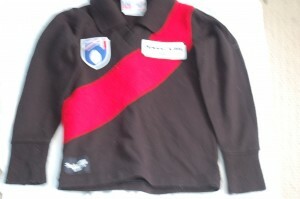 The AFL , marked the opening of the 2011 Season, by providing rock band entertainment , asking team players to assemble to sing the National Anthem, and inviting recently retired players to toss the coin for the first bounce of the ball. There were many highlights , such as Jack Riewoldt kicking six goals for the Richmond Tigers . The dominance of Collingwood is still apparent , and the resurgence of the Bombers has ignited their fans passions . Many watched , many went to the Game , and many wore their football jumper , jersey , guernsey . This entry was posted on Monday, March 28th, 2011 at 9:51 am	and is filed under AFL, football jumpers, NRL. You can follow any responses to this entry through the RSS 2.0 feed. Both comments and pings are currently closed.